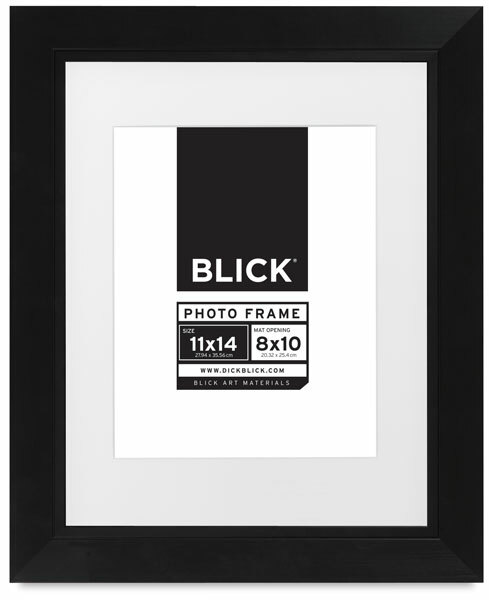 Designed with functional simplicity and elegance, the Blick Focus frame features clean lines and brushed finishes that mirror current trends in architecture and design. These value-priced polystyrene frames complement any décor and look great with photographs, etchings, sketches, prints, diplomas, and more. A lower-cost alternative to wood frames, Blick's revolutionary new polystyrene frames are lightweight, durable, and available in a variety of profiles and styles that complement your artwork without overpowering it. Made of extruded polystyrene that contains 70-80% recycled material, every frame is as eco-friendly as it is beautiful and functional. Every Focus frame includes a mat, a backing board, and an acrylic face. Blick polystyrene frames consist of an extruded polymer core onto which a hot foil finish is applied. Sophisticated manufacturing processes give the frame moldings several advantages over similar wood moldings, including a lower price and higher quality. Comprised of three elements — the Core, the Skin, and the Finish — these frames offer superb consistency of quality and style, all at a value price. The Core — The Core is made from extruded foamed polymer that is derived from approximately 70–80% recycled material and 20–30% virgin material. The recycled element is derived primarily from two sources, the electronics industry (using computer casings and other products) and the food packaging industry. Special additives offer a balance of elasticity and rigidity that allows for easy joining, yet gives strength to the frame. All excess polymer material is recycled back into the production process. The Skin — Only virgin polymer granules are used to create a very smooth, hard outer surface onto which hot stamping foil is applied. The Finish — Hot stamping foils are applied to the smooth, hard outer skin. Sometimes several different foils are used on a single molding, or grain and textured patterns are embossed into the surface by gently heating the skin.